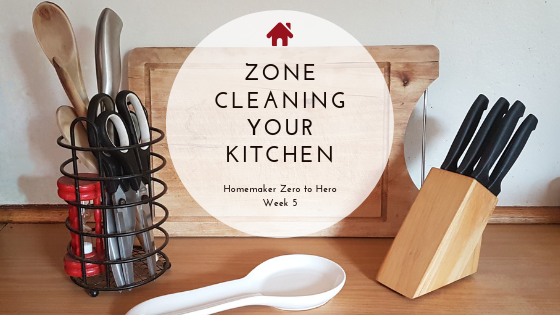 We are on Week 3 of the Homemaker Zero to Hero process. I can already tell that I am not going to be popular with a lot of people this week because I am going to ask you to take better care of yourself and dress like a professional homemaker. Imagine you are conducting an interview for a housekeeper. In walks a clone of you on your average day, dressed exactly as you usually dress on your average day. What would your first impressions be? Here is the thing, when you dress the part, you feel better within yourself and you feel more capable of doing the job you need to do. It is like you are tricking your brain into believing in yourself. I noticed this when I was working full time as a programmer. If I had to deal with the business side of my job, or the consultation side, I would dress in a business suit and feel more confident to pull off anything required of me. If I had to sit down and focus on some heavy coding, I felt more confident in my abilities as a programmer if I was wearing jeans, a hoodie and headphones. As a homemaker, you need to figure out what is your “look”, what do you need to wear to make you feel more confident in your ability to manage your home. On my heavy cleaning day I wear yoga pants, sneakers and a woman’s gym top. The rest of the week I am in Jeans or jean shorts and a t-shirt with sneakers. 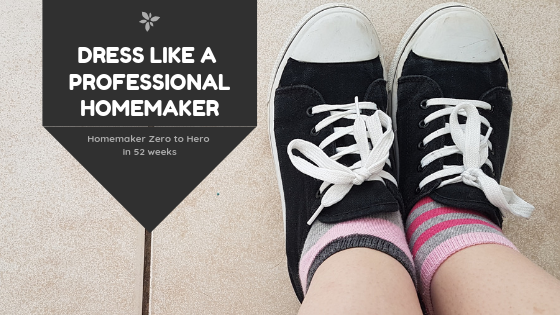 Your homemaking outfit is up to you, but keep in mind it needs to be comfortable and you need to be able to move fast, that is why I wear comfy sneakers. Here is my pinterest board with Professional Homemaker Outfit Ideas. Besides for your homemaking outfit, there are a few things you can do every day to trick your mind into thinking/feeling more professional. We are going to create personal cards for our index card files that will help trick our minds and to cover our essential daily tasks. I am sure most of the essential daily tasks you are doing already, but I think now is a great time to include them in this system. Wash Hair – Frequency is up to you, mine is a weekly card. Manicure/Pedicure – Frequency is up to you, mine is a weekly card. Put cream on skin – Frequency is up to you, mine is daily after the shower/bath card. Of course you must decide how frequently you do each of the things above. Daily and Every Other Day cards will be highlighted Yellow. Weekly and Every Other Week cards will be highlighted Blue. The manicure/pedicure card doesn’t need to be elaborate. It is just a reminder to check your nails and trim them if necessary, maybe put some clear nail varnish on them. I found that colored nail varnish was more trouble than it was worth. By Wednesday it was usually chipping off my fingers and I didn’t have time to put on fresh. My hair wash and manicure cards are on Saturday so that I look nice for Saturday evening activities and for church on Sunday. You may notice some of the cards above are pretty silly for some of you, like the brush teeth cards. I will be honest, since having children just finding the right moment to brush my teeth has been a problem. It used to be after breakfast and before I started my daily work. Then my children arrived and my whole routine had to change, finding that right moment to brush teeth was a challenge that I am only beginning to overcome. That is what is nice about this system, if the routine doesn’t work on the first day, you can move cards around on the second day to try and make the routine work for you. After a month you will probably have found your grove. Then after 3 months a life changing event comes along and you may have to revamp the whole routine. These life changing events are what has prevented me from establishing a good cleaning system until I learned about the index card system. I believe this is the first time we are including weekly cards in our system. They are very easy to use, you will put them on the day of the week that you are planning to do them. When you get to that day, find a suitable spot in your routine to do those cards. When you are finished with the card move it to the following week instead of the following day. Easy. In addition to our personal care cards, we are also going to add a few bare essential housekeeping cards. You are probably doing all of these automatically, or on an as needed basis. I have found that there are two things that need to be done every day in a family of 5. They are dishes and laundry. If you have less people or are living alone then you may do them less frequently. In that case, feel free to make these every other day, or weekly cards if that is what suits your family. Remember, weekly cards are highlighted blue. I have a reminder to open curtains here. The curtains in my master bedroom are white so they let a lot of sunlight through even when closed. I never open the curtains in the master bedroom unless I see my card reminding me to do it. I am sure that I am not the only person in the world that does this. Here is the thing that a lot of you may have realized about me. On the surface, I appear to be naturally organized. The truth is I am not. Because being organized doesn’t come naturally to me, I have developed systems to help me cope with my weakness. That is all we can do, figure out our weaknesses, decide we want to be better people and build a system to cope with our weakness. Over enough time you will become so good at using your system that it will appear as though you have a skill in something that you don’t actually have. I hope you have a great week. Next week we are going to learn how to divide our home into 5 cleaning zones. Don’t forget to subscribe to my newsletter so that you will stay up to date with this weekly series.